For his son, the World War I-era U.S. Army general, see Samuel D. Sturgis Jr. (1861–1933). For his grandson, the World War II-era U.S. Army general, see Samuel D. Sturgis, Jr.
Samuel Davis Sturgis (June 11, 1822 – September 28, 1889) was an American military officer who served in the Mexican–American War, as a Union general in the American Civil War, and later in the Indian Wars. Sturgis was born in Shippensburg, Pennsylvania. His parents were Mary Brandenburg and James Sturgis. He entered the United States Military Academy at the age of twenty and was graduated 32/59 in the famous class of 1846 as a brevet second lieutenant in the 2nd Dragoons. That class also included among its graduates John Gibbon, George B. McClellan, Jesse Reno, and George Stoneman, who would fight on the Union side and Ambrose Powell Hill, Thomas Jonathan "Stonewall" Jackson, and George Pickett, who would fight on the Confederate side. During the Mexican–American War, he served with the 1st Dragoons and was captured and held for eight days as a prisoner of war while making a reconnaissance near Buena Vista, Mexico. After the war, he served in the West, was promoted to first lieutenant and captain, and took part in a number of Indian campaigns. During this time, Sturgis was sent to West Ely, Missouri, where he met Jerusha Wilcox. In 1851 they married and would have six children. When the Civil War broke out, Sturgis continued to serve with the 1st Dragoons (which was shortly afterwards redesignated the 1st Cavalry Regiment). He was promoted to major in May 1861 and later transferred to the 4th Cavalry Regiment. In August 1861, at the Battle of Wilson's Creek, he succeeded to command of the Federal forces after the death of Brig. Gen. Nathaniel Lyon. In March 1862 he was appointed breveted brigadier general of volunteers to rank from August 10, 1861, the day of the battle, as well as breveted lieutenant colonel, Regular Army. After a tour of duty in the Washington, D.C., defenses, he was ordered to the front to support General John Pope's Army of Virginia just prior to the Second Battle of Bull Run. While attempting to secure priority from General Herman Haupt for movement of his troops on the railroad, he was told that he must wait his turn as other troops and supplies were going forward to support Pope. His reaction was his now-famous remark, "I don't care for John Pope one pinch of owl dung." 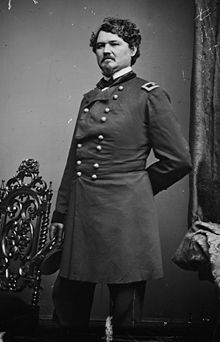 Sturgis then commanded the 2nd Division in the IX Corps at the battles of South Mountain, Antietam, and Fredericksburg. He went west with IX Corps in 1863 and was promoted to lieutenant colonel with the 6th U.S. Cavalry on October 27, 1863 and later had a number of relatively unimportant commands in Tennessee and Mississippi. He also served as Chief of Cavalry of the Department of the Ohio. In June 1864 he was routed by Nathan Bedford Forrest at the Battle of Brice's Crossroads in Mississippi, an encounter that effectively ended his Civil War service. Sturgis was breveted brigadier general (for South Mountain) and major general (for Fredericksburg), Regular Army, in March 1865 and mustered out of the volunteer service in August. He reverted to his regular rank of lieutenant colonel of the 6th U.S. Cavalry. On May 6, 1869, he became colonel and commander of the 7th U.S. Cavalry and his lieutenant colonel was George Armstrong Custer. Sturgis was on detached duty as the Superintendent of Mounted Recruiting Service and in command of the Cavalry Depot in St. Louis, Missouri, when parts of the 7th Cavalry were destroyed at the Battle of Little Big Horn (one of Sturgis's sons, Second Lieutenant James G. Sturgis, was also an officer with the 7th and was killed in that battle.) Samuel Sturgis then took personal command of the regiment and led the 7th Cavalry in the campaign against the Nez Percé in 1877. Sturgis and his soldiers headed off the Nez Percé and waited to attack them after when they emerged from their passage through the wilderness of Yellowstone Park. The Indians deceived Sturgis with a feint and eluded him, continuing their flight northward toward Canada. Sturgis soon caught up with the Nez Percé but at the Battle of Canyon Creek, the Indians, although outnumbered two to one, again escaped from his grasp. From 1881 until 1886, Sturgis was governor of the Soldiers' Home in Washington, D.C. He retired in 1886 and died in Saint Paul, Minnesota in 1889. He is buried at Arlington National Cemetery. His son Samuel D. Sturgis, Jr. became a general in the United States Army, and was a division commander in the American Expeditionary Force during World War I. His grandson Samuel D. Sturgis, Jr. also became a general in the United States Army and served as Chief of Engineers from 1953 to 1956. The city of Sturgis, South Dakota, is named for Samuel D. Sturgis. A sculpture of him mounted on horseback is located at the eastern entrance of the town on South Dakota Highway 34 and 79. The USS General S. D. Sturgis (AP-137), a World War II troop transport ship, was named in his honor. ^ a b c d e "Online version of Cullum's Register of Graduates of the United States Military Academy - Class of 1846 - Samuel D. Sturgis". Retrieved 10 December 2018. ^ Chicago and North Western Railway Company (1908). A History of the Origin of the Place Names Connected with the Chicago & North Western and Chicago, St. Paul, Minneapolis & Omaha Railways. p. 128. Wikimedia Commons has media related to Samuel D. Sturgis. "Samuel D. Sturgis". Find a Grave. Retrieved 2009-05-12. This page was last edited on 11 December 2018, at 17:42 (UTC).